An Audi car stolen from a showroom in West Lothian has been recovered by police. However, another two taken in the raid remain missing. The high-value theft took place at the Calder Motor Company premises within Camps Industrial Estate in East Calder sometime between 1.30am and 6am on Tuesday. In addition to the theft of the Audis - which had a combined value of £75,000 - police said "significant" damage was caused to other vehicles and the showroom itself. On Thursday, police confirmed they recovered a black Audi from outside an address in the Wishaw area of North Lanarkshire on Wednesday evening. 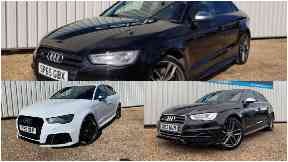 A white Audi with the registration YF65 XLP and a black Audi with the registration GU63 NGN remain at large.